There have been some interesting comments circulating on the web about Clay Aiken the last few days. One of the more “interesting” comments was about Clay and his work with children. The person who started the rumor stated that Clay did not really care about working with children. He only took the UNICEF trips and worked with kids here because he wanted to help his career. OK…………..Please check out the following! All of these pictures were taken before American Idol, Season II. 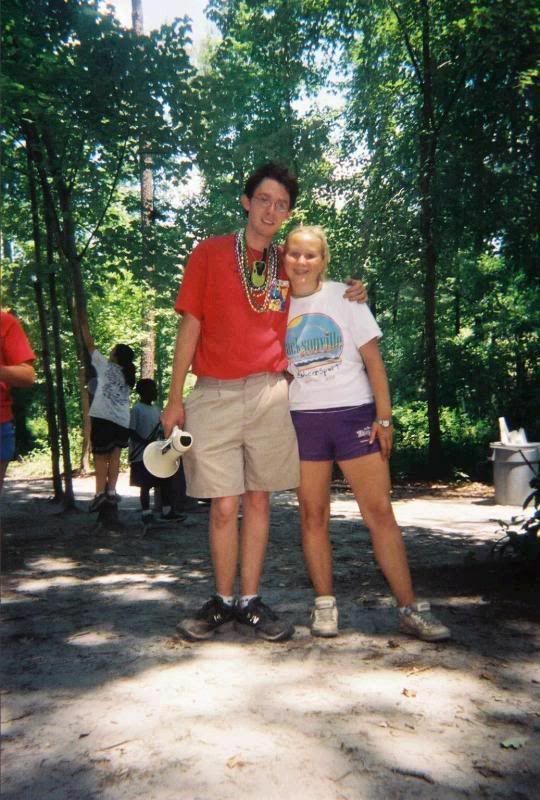 Clay was a counselor at Y-Camp for many years. “I’m often asked what I would do to change the world of I had the power to do anything. “There are so many kids in this world who could use another person looking out for them. Someone who will help them to discover their strengths and rise above their weaknesses. Someone who offers another opinion of their worth. On a side note………CANN appreciates all the comments that our readers leave. It is wonderful to get feedback from our readers. This is a Clay Aiken board. The comments are being moderated and we have never and will never approve comments bashing Clay, his fans or this site. When I first heard Clay Aiken on American Idol I was captivated by his voice. During an interview he stated he was a student studying special education – at that point he had my heart. Clay said from the beginning that he wanted to use any celebrity that he may have to make a difference – he has in ways too numerous to mention. Thanks for the pictures and the quotes!!! SueReu, your comment echoes my feelings about Clay. I "discovered" Clay just a few months ago on YouTube, when I clicked on his performance of BOTW on AI, & it knocked my socks off. Since then, I've seen interviews he's given, read his autobiography, & listened to every song he's recorded, & I'm shocked & appalled that there are people who believe Clay's interest in children is for the express purpose of furthering his career!!! In an interview he did while he was a contestant on AI, he said that he didn't care how he made a difference, whether it be as a special ed. teacher or as a result of AI, just so long as he did make a difference, & he absolutely has & continues to do so. I can't wait to see him in concert, & look forward to being able to meet him & let him know what a difference he's made in the life of my grandson, who has autism. Clay Aiken has always been one in a million of really good and caring people..long before stardom. I came for the voice, I stayed for the man. It was the voice that first got my attention, but that wasn't enough to keep it- it's Clay as a person that continually draws me in, and a lot of that has to do with his efforts as a humanitarian. Whoever made those awful comments obviously doesn't GET that this wasn't Clay's plan for life. 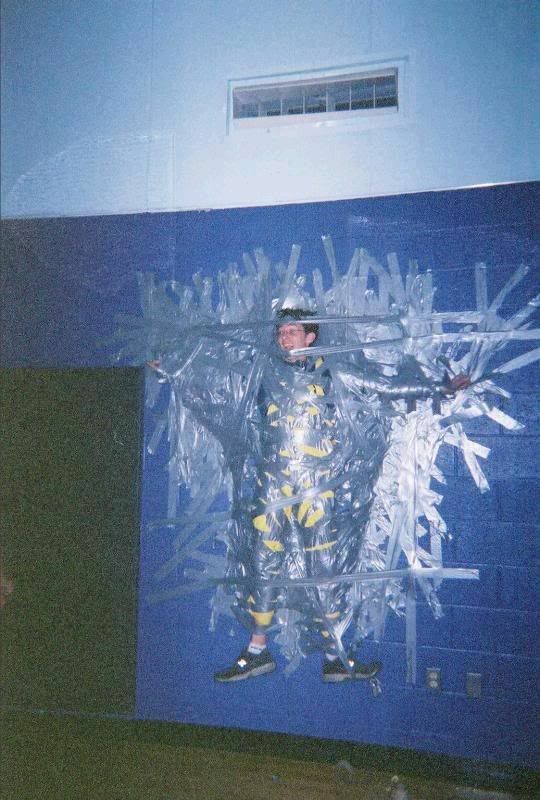 He was going to be a teacher, a special ed teacher. He never planned on all this, but he's using his celebrity to make a difference. It's a fresh breath of air amidst all the stagnation of people who are famous for being "famous," and who do nothing but party their fame away. Sad that people constantly feel the need to bring down someone who does so much good. about inclusion in ALL cases. Gotta love that about Clay, plus UNICEF, plus etc. etc. one day I can live up to his commitments. I remember well when Clay Aiken on an interview with ABC said that AI created a bigger stage for him to use his celebrity to help the children. As far as I can tell the fame is not as important to him as the work he does with UNICEF, National Inclusion Project, and numrous other charities like Broadway Cares, the monies he donates to different organizations(without fanfare I might add). That is why I am a fan of his, besides he sings like no other! I agree, clayam, that fame isn't as important to Clay as the work he does with UNICEF, NIP, & other charities to which he donates his time & effort. Someone please correct me if I'm wrong, but I'm sure Clay is on record as saying that if people either stopped buying his CDs or he stopped performing, he would return to teaching special ed. kids in a heartbeat, since his real passion is helping children. The fame simply enables him to do more on a bigger scale, & is the real reason for the effort he put forth on AI & everything he's done before & since. It is strange that the very people who spread the hate and lies about Clay are the very ones he's say to try to understand them and INCLUDE them. Some have probably suffered because they didn't have an advocate for inclusion. Thanks, CANN for the very informative information. Ignorant people will always question the motives of those who put them to shame. Clay has always talked the talk and walked the walk. There is no "celebrity" in Clay when he is working for the welfare of all children. Clay has made a huge difference and the foundation that he and Diane Bubel created, continues to touch many lives. There are many things that Clay does that go completely unnoticed because that is not what he is all about. He isn't calling the media to follow him around. He does not work with children for a photo op. Clay's heart is in the right place and always will be. I'm proud to be a fan of this man and proud to be a huge supporter of the National Inclusion Project. It's a shame that others feel the need to bring someone down in order to make someone or themselves feel better. Don't forget that he did wonderful work with Michael Bubel, Diane Bubel's autistic son, before he was on AI while he was in college studying to be a special ed teacher. If Diane didn't think Clay was sincere and a good person she would not have suggested for Clay to audition for AI and would certainly not support the foundation. Clay received his college degree based on his work to create the foundation, now known as the National Inclusion Project. Criticizing Clay's humanitarian efforts will not take all his has done away, it just shows ignorance of the facts. What a kind, wonderful man. Anyone can see he loves children. Clay Aiken is the Real Deal! Thanks for this blog. It clearly shows the man Clay Aiken truly is. He did not BECOME this man after being on AI. He has ALWAYS been dedicated to making a difference in the lives of children and others throughout this world. What a difference he and his foundation- National Inclusion Project-has made and will continue to make.I could not be prouder to be a fan of his. To paraphrase a song "Because I knew him, I have been changed for good". I have loved Clay from the very beginning on AI. I have all his CDs, have gone to 9 concerts and went to see Spamalot three times. I am agreat grandmother and hope to live long enough to see Clay celebrate 25 yrs in the business. Not only is he a great singer and humanitarian he is not DULL. alook what he has put us through this year and a half. He is his own person and I think that is what upsets some of his naysayers. Love this man and his family. There are some people in the world, I am sure who Do do the charity work for their own gain. And there are those who do it because it is a part of who they are, part of what they believe in. Clay Aiken is part of that group. He has been doing good works long before he ever graced the stage of American Idol! I think if all of us could have 1/4 of the charitable heart that Clay does, the world would be a much better place! Clay was involved in many projects in Raleigh, at the YMCA before he ever appeared on the AI Stage. He also worked with Michael Bubel…Diane Bubel's son…who has Autism. In fact, it was Diane Bubel who encouraged Clay to try out for AI. From the very beginning of AI, Clay always said he wanted to make a difference…and by starting his own foundation, which is now called the National Inclusion Project, and joining Unicef as a Unicef Ambassador, he certainly has made a difference. Not only is he a great Humanitarium, but he is one of the best singers, performers, and an all around good guy. Clay Aiken truly is a man, who not only talks the talk, but he walks the walk. He said from the beginning that he wanted to make a difference – that the fame wasn't about money or being famous – but rather it was an opportunity, and yes, a responsibility, to give back. This is the man we chose to follow – and I think we chose wisely. Great blog Musicfan. Clay is and always has been one of the most kind and caring people you'll ever meet. I am proud to say that I am a fan of his and always will be. Those pctures sure tell the REAL story. Thank you for this blog, and for giving us the opportunity to comment. When I see the ugly lies that some really strange people are circulating regarding Clay Aiken's motives for the humanitarian work he does, I want to cry. They don't care the amount of time and effort that he puts into his foundation for inclusion. They criticize his UNICEF trips, that are done from his heart…..they do no research before making their ignorant remarks, and aren't aware that ALL celebs who work for UNICEF.. PAY ALL OF THEIR OWN EXPENSES. Wonderful blog about a wonderful advocate for children . One thing I have never doubted is Clay's sincerity about helping children and about his dedication to making inclusion a part of all children s' lives. In fact I believe that is more important to him than any celebrity he has or will achieve. Clay['s good heart shines through him in everything he does. Also I just have to say Kudos to Clay Aiken News Network for this "On a side note………CANN appreciates all the comments that our readers leave. It is wonderful to get feedback from our readers. This is a Clay Aiken board. The comments are being moderated and we have never and will never approve comments bashing Clay, his fans or this site." I appreciate you. I read that comment. How sad. I also came to the Clay Party late. Almost 5 yrs. late. When I heard his voice I was amazed. How did I miss him? I am not a TV watcher. I have not seen American Idol but one time. That was this year. Not my cup of tea. ( edited for personal comment) I can't wait for his music and concerts again. I hope to meet some of you soon. Like someone stated earlier, he does put many people to shame because so many people do not think of any one else but themselves. I have a special need child and am in a support group with other such parents. You would not believe the pain and heartbreak we feel as we help our kids. Many of the parents suffer break-down or burn-out because it takes a lot to mother one such child. And yet we love our child. I cannot imagine how much compassion and love it would requires of a young man to devote part of his life to such work … it takes a big man with a big heart. As Clay’s fame grew, so did his heart. It does not matter what others choose to say, you cannot hide genuine compassion and love (Read how he showed tenderness and care when he met Khrystyna and he adjusted her glasses for her). Everything Clay has done has come from the heart. No one can take that away from Clay. I was working in an office in Raleigh in 2003 while AI season 2 was airing. Some of the moms working there had kids who had had Clay as their YMCA counselor. The moms told us that their kids adored him. There were also people working there who knew Clay personally. They all said he was a nice guy and what you saw on TV was the Clay they knew. .
During the AI2 summer tour they all had a day off. Everyone but Clay went to the beach. Clay spent his day off at a summer camp for kids. That's the kind of guy he is. When I first saw that picture of Clay on his knees dancing with that woman and looking at her with such love, I knew I would love and support him forever. His voice alone would have been enough, but he is so much more than just a beautiful voice. Error: Error validating access token: Session has expired on Tuesday, 21-Aug-18 16:13:01 PDT. The current time is Thursday, 18-Apr-19 11:42:41 PDT.